US Part 5 and Canadian amateur 'Watering Hole' around 137.780kHz . . . Refreshes every nail-biting minute. Dear FCC: There is a *worldwide 136kHz amateur band*. The two-part display above has at top a somewhat hallucinogenic horizontal spectral waterfall which refreshes every minute, with about 30 minutes of history shown. (I'll work on the colour scheme, but don't hold out much hope.) 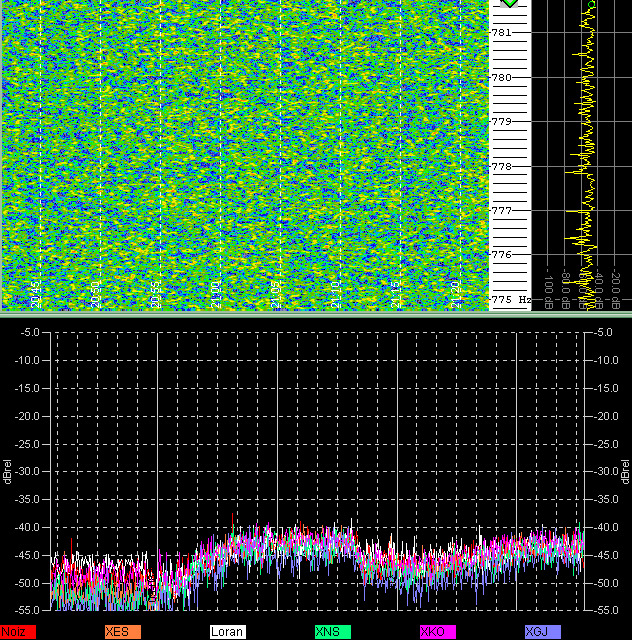 Below it are signal-strength vs. time plots for a Loran line at 137776.1Hz, a background noise reference, and some of the usual suspects. 'XDW' - 755.2/.6 - WD2XDW - or 'Radio America', Laurence KL1X/5 in Bartlesville, Oklahoma. The LF 'Part 5' stations are neither 'Lowfer' nor amateur stations, in a legal sense. In practice they are both. When the FCC in their great wisdom refused to allocate the *worldwide 136kHz amateur band* to US amateurs (under FCC rules Pt. 97), they did suggest LF experiments could be pursued under both Part 15 ('Lowfer' rules) and under Part 5 (experimental rules). Quite a few took them up on the suggestion, braved the fearsome Dragons of Gettysburg, and have been granted Part 5 licences, mostly for operation in and around the *worldwide 136kHz amateur band*. Although there were quite a few 'amateur-style' Part 5 grants prior to this (the AMRAD beacons near DC, W0RW on 480 kHz in Colorado and The Six Hundred Meter Research Group (SHMRG(!)) spring to mind), the current crop are doing pretty much what the amateur community would have been doing should the *worldwide 136kHz amateur band* have been allocated instead.